with..."The BASS CLINIC on Lake Fork! Take your son, daughter, wife, father or fishing buddy on a fishing trip of a life time! 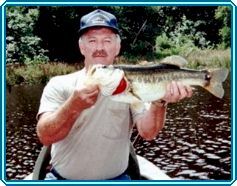 Roy offers fishing trips on a 15 acre private lake located adjacent to Lake Fork. This private lake is a trophy bass lake with proven results! 20-30 + bass a day, with a good chance of hooking a 10 + lb. bass. top waters, jigs, wacky worm, drop shotting, spinner and buzz baits. and experience excellent fly fishing. on just about any technique you've ever wanted to work on. beginners. We always provide lures. Because the lake is on private property you don't even need a Texas fishing license. (No Texas or non-resident fishing license required on private waters).